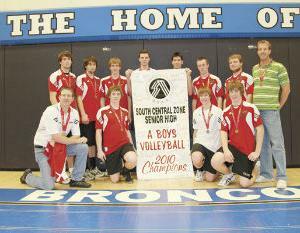 Acme's Senior Boys returned from the 1A Volleyball Zone Tournament as 2010 Zone Champions. The eight-team tournament was held in Bassano, with Acme winning 10-0, defeating Standard, Bassano, and Duchess in round-robin play, Olds Koinonia Christian in the semi-final, and Rosemary in the final. Devin Woodland, a young man who grew up in Three Hills and graduated from Prairie Christian Academy in 2008, has received an ACAC all-conference selection in cross-country running as a result of his fourth place finish in the ACAC provincial championship 8 km race. The Three Hills Thrashers scored ten goals on Friday night and then ten more on Saturday night to earn a pair of victories.